Great Expectations: what is a person’s worth? I was dismayed by the recent BBC TV adaptation of Great Expectations (and by the almost uniform acclaim that it received), but unsure how much my memory of the work was influenced by the David Lean film version, so I decided to read the book again. It proved to be a welcome return to a novel that had a profound effect on me as a child, with its central question as to how far the pursuit of status and wealth lead to loss of humanity: as Pip ascends he falls, and as he falls he rises. I had great expectations of the BBC series, following as it did a recent sequence of superb BBC Dickens adaptations: Andrew Davies’ superb Bleak House (2005), Little Dorrit (2008 – Andrew Davies again), and Julian Farino’s Our Mutual Friend (1998). But this Great Expectations was a travesty, totally lacking the sense of Pip’s journey to moral awareness, as well as the one thing that makes any Dickens novel memorable and great – comedy and character. Pip is not a prig, but this was how he was presented in the TV adaptation, seemingly ignoring the fact that the novel is narrated by an older Pip looking back and reflecting subtly and frankly on his earlier fears, ambitions and limitations. Clearly, when you’re restricted to a three hour dramatisation you can’t include everything. But to leave out the humour, to distort key characters and to omit or leave undeveloped other important characters, such as Biddy or Wemmick, was lamentable. Gillian Anderson’s portrayal of Miss Havisham was just plain daft, her youthful appearance making nonsense of the chronology of the novel. The repeated club scenes and the brothel scene took one paragraph from the novel – that has Pip and Herbert joining the Finches in Covent Garden with a very subtle hint of a brothel – and over-egged it. Dickens gave us characters drawn from across the whole social gamut, and was the great delineator of the gulf that separated those at either end of the spectrum. Dickens’ great theme in Great Expectations (or at least, one of them) is the dream of social betterment (a dream that is revealed as a mirage). Pip’s desire for self-improvement is the main source of the novel’s title: because he believes in the possibility of advancement, he has ‘great expectations’ about his future. Advancement may be obtained through money or by learning; but affection, loyalty, and conscience prove more important than social advancement, wealth or class. The Educational scheme or Course established by Mr. Wopsle’s great-aunt may be resolved into the following synopsis. The pupils ate apples and put straws down one another’s backs, until Mr. Wopsle’s great-aunt collected her energies, and made an indiscriminate totter at them with a birch-rod. After receiving the charge with every mark of derision, the pupils formed in line and buzzingly passed a ragged book from hand to hand. The book had an alphabet in it, some figures and tables, and a little spelling,— that is to say, it had had once. As soon as this volume began to circulate, Mr. Wopsle’s great-aunt fell into a state of coma, arising either from sleep or a rheumatic paroxysm. The pupils then entered among themselves upon a competitive examination on the subject of Boots, with the view of ascertaining who could tread the hardest upon whose toes. This mental exercise lasted until Biddy made a rush at them and distributed three defaced Bibles (shaped as if they had been unskilfully cut off the chump end of something), more illegibly printed at the best than any curiosities of literature I have since met with, speckled all over with ironmould, and having various specimens of the insect world smashed between their leaves. This part of the Course was usually lightened by several single combats between Biddy and refractory students. When the fights were over, Biddy gave out the number of a page, and then we all read aloud what we could,— or what we couldn’t — in a frightful chorus; Biddy leading with a high, shrill, monotonous voice, and none of us having the least notion of, or reverence for, what we were reading about. When this horrible din had lasted a certain time, it mechanically awoke Mr. Wopsle’s great-aunt, who staggered at a boy fortuitously, and pulled his ears. This was understood to terminate the Course for the evening, and we emerged into the air with shrieks of intellectual victory. I told Joe … that I wished I was not common, and that the lies had come of it somehow, though I didn’t know how. This was a case of metaphysics, at least as difficult for Joe to deal with as for me. But Joe took the case altogether out of the region of metaphysics, and by that means vanquished it. I had not been mistaken in my fancy that there was a simple dignity in him. The fashion of his dress could no more come in its way when he spoke these words, than it could come in its way in Heaven. Reading these passages again, imbued with the sense of class and the perils of getting too far above yourself, I recalled how, in my teens, these ideas spoke powerfully to me as a boy from a working class background who had passed the 11 plus to go to a Direct Grant grammar. This was a school which took fee-paying boys from privileged backgrounds, whose rugby team competed in a league with public schools, and where you would be caned if you played football in the lunch hour. Coincidentally, while I was engaged in re-reading Great Expectations, BBC 4 broadcast a documentary about grammar schools that focussed on their heyday – the period from the 1950s to the 1970s, during which they were opened up to youngsters like me from working class homes, and before the introduction nationally of comprehensive schools. What was remarkable about this film was the way in which Dickens’ theme in Great Expectations resonated throughout. Remarkable, too, was the fact that just about everyone who told their personal story ended up at some point in tears. For some, tears came with the memory of a teacher who had shown faith in their potential, for some recalling sacrifices made by parents, while for others it was the memory of tensions and conflict with parents or peers who resented their advancement or could see no point in it. That was my story, for sure. Later, at university and doing a course in sociology, echoes of Great Expectations came back to me when we studied the research that explored the tensions of between class, culture and school. One such study was Education and the Working Class by Brian Jackson and Dennis Marsden. First published in 1962, it took a sample of 88 working-class children educated in Huddersfield and revealed how they were caught between two cultures – home and school. Meanwhile, there was Basil Bernstein’s work on language that underlined the point that the working class pupil is culturally different – but not deficient. I took Biddy into our little garden by the side of the lane, and, after throwing out in a general way for the elevation of her spirits, that I should never forget her, said I had a favor to ask of her. “How helping him on?” asked Biddy, with a steady sort of glance. “O, his manners! won’t his manners do then?” asked Biddy, plucking a black-currant leaf. “O! they do very well here?” interrupted Biddy, looking closely at the leaf in her hand. “And don’t you think he knows that?” asked Biddy. “Proud?” I repeated, with disdainful emphasis. “Well? What are you stopping for?” said I. By the end of the novel, Pip has discovered the true worth of Joe and Biddy. Even the taint of crime and prison which Pip has been desperate to escape cannot hide Magwitch’s inner nobility, and Pip is able to ignore his social status as a criminal and offer him gratitude and succour. Pip has learned to trust his conscience and to a see the real worth of a person, irrespective of wealth, learning or social standing. He has discover that the Victorian idea of a ‘gentleman’ is built on sand. 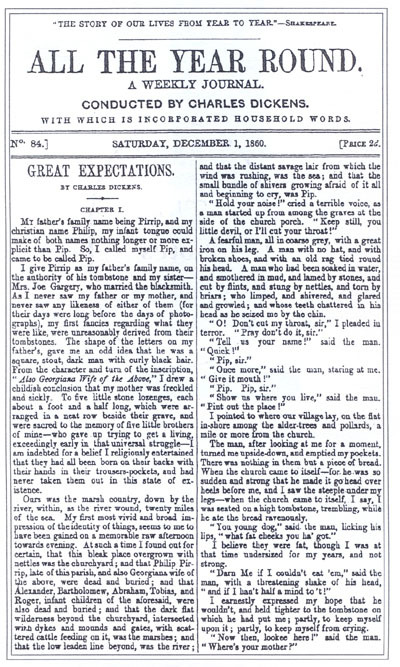 Charles Dickens’s Great Expectations was published in thirty-six weekly instalments in Dickens’s journal All the Year Round between 1860 and 1861. The first part appeared on December 1st 1860 (above). Great Expectations’ has been called the greatest of all the Dickens films …[it] does what few movies based on great books can do: creates pictures on the screen that do not clash with the images already existing in our minds. Lean brings Dickens’ classic set-pieces to life as if he’d been reading over our shoulder: Pip’s encounter with the convict Magwitch in the churchyard, Pip’s first meeting with the mad Miss Havisham, and the ghoulish atmosphere in the law offices of Mr. Jaggers, whose walls are decorated with the death masks of clients he has lost to the gallows. At the mention of each name, she had struck the table with her stick in a new place. She now said, “Walk me, walk me!” and we went on again. The best of Lean’s film is in the first hour, but later on the film takes great liberties with the story with, for example, Estella never marrying the odious Drummle, Miss Havisham’s death occurring much earlier, and culminating in a happy ending quite different even to Dickens’ revised version. What are we Meant to Think of Pip? I too was brought up in the sixties Gerry and somehow, although always seemingly somewhere near the bottom of the class in pre-eleven plus years, I actually passed it! I hated Grammar School! (well, mostly) Boys only, caning on the menu, fights, bullies, teachers, its my way or the highway methods. it was a helluva shock to a shy boy in 1966 from working class parents, I suppose some would call it character building. Little empathy. A guy (name forgotten) on the radio this week said that the most distinct thing missing from psychotic people was empathy, 1% of us are psychotic, but strangely 4% of all Industry heavyweights show psychotic symptoms……brings us back to certain financial areas I believe. Before I forget, whilst great writing is on the menu, I heard Jeanette Winterson on Radio 4 last week reading her essay ‘A Bed. A Book. A Mountain’, wonderful and the whole book itself is profound, the joys, discoveries and essentialness (is that a word…who cares!) of reading. Very cheap from Amazon too. That program about Grammar schools resonated with me too and it was quite shocking to me how those tearful responses to the sacrifice, the pain and pleasure was remembered by those featured. Shocking because I felt that way too (the suppressed anger bit) and I’ve never known why until recently. I watched a couple of videos on a site called ‘TED TALKS’, talks given in about 20 minutes by pretty profound speakers, usually in California. These two talks were given by Sir Ken Robinson and are funny and forward looking in that the focus is on the child. He followed up by writing a book called ‘The Element’, which is about the nurturing and encouragement of the child, featuring many amazing heartfelt stories of how successful people got from their childhood to where they are now. Another great book, ‘From Boys to Men’ by Brett Stephenson uses the late…very late Joseph Campbell s various thesis, gained by 60 years of ancient world study by principally employing his ‘Hero’s Journey’ methodology in guiding teenage boys through their difficult years. Anyway, someone please stop me before my ire gets raised about the old sausage factory education and the class system. Am I bitter? Damn right I am! We’re supposed to get mellower as we get older aren’t we? Hmmmm. I’m glad that I’m not the only one that found the tv adaptation to be rubbish! I’ve never seen that Robert Buss picture before and like it very much. Thank you for this post, Gerry … and much more. It was the lack of any humour, that was most notable, the quirky characters of both the book and the David Lean film; Joe’s “Pip ol chap” ;the first meeting and boxing match between Pip and Pocket; numerous other scenes. Totally lacking in the recent version. The film was less than two hours long, so the TV version was not any more or less pushed for time. It was almost the total lack of “Dickens” in the script and individual scenes. Too much time spent on lush settings but….it was empty of almost any sense of Dickens.